One sunny afternoon over Christmas I was out walking with my dad. We regularly take our cameras with us when we go out walking and have competitions to see who can take the best photos. I was trying to explain to my dad about taking landscape shots and the ‘ingredients’ that are required for this particular type of picture. I was going through all the different elements with him when I saw a perfect opportunity to capture this great piece of scenery. I think it’s good anyway. Lol! Let me know what you think! I was telling him later, when we were reviewing each other’s pictures that the path is meant to lead the viewer’s eye into the shot. You also have the people on the path, which I think adds interest and the lighthouse at the top of the hill in the background. It also helped that the Sun was behind us, which made the picture look bright and colourful. I used a Panasonic Lumix Fx33 compact camera to take this picture and as it was slightly slanted, I straightened it up with Google Picasa 3. I love the picture. Great landscape shot! I came across your site on Technorati. As a South African photojournalist and author I certainly found it useful and will refer students to it. Thanks for your comment Hilton. It keeps me motivated and enthusiastic when people leave positive comments about my pictures. It would be great if you could share some of your favourite shots. Have you taken any good wildlife shots? How about your students, do they have any photographs with an interesting story behind them they would like to share? 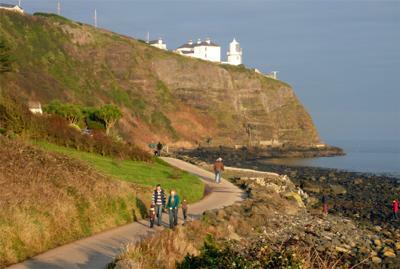 You have captured our beautiful coastal path so well. If you love the Blackhead Path then why not become a friend or join our campaign to keep the path open. Thanks.